Ants on the Melon»Blog Archive » Where Am I? Seriously, that was the question I had to ask myself today when I took a wrong turn in Lake Jackson while I was on my way to go surfing. 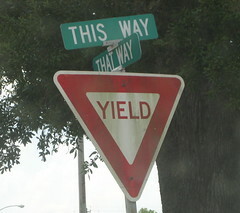 I was told to yield at the corner of This Way and That Way. Huh? Are they letting hippies name streets again?